I met my friend Melissa Steinman in the small village of Seal Rock, just 10.5 miles south of Newport. Seal Rock is an undiscovered gem where you’ll find artists at work, tasty treats and, on the rocks themselves, some incredible nature watching. The rocks are best seen at low tide, so we had time to explore the galleries and shops. Several artists’ studios are located in Seal Rock — Brian McEneny was at work bringing the wild to life with his wood carvings, and a glass blower and stone carver exhibit in neighboring shops. The Seal Rock Espresso and Bakery kiosk offered steaming cups of java. And how could we possibly resist the ‘made from scratch’ baked goods? Melissa chose the maple bar and I savored a cinnamon scone, still warm from the oven. At the Seal Rock Wayside we finished our coffees while watching rainbows painted by the morning sun flash on the waves. Then, brushing crumbs off our jackets, we followed an easy trail down to the beach. The receding water exposed rocks and tidepools teaming with life. Melissa pointed out sea anemones, purple and red sea stars, and edible seaweeds. Gulls whirled and cried overhead, attracted to the food-rich environment, while cormorants and murres perched on the rocks. Then we headed to Waldport, a few miles south, and Melissa turned into the parking lot at the Alsea Bay Bridge Interpretive Center. There are terrific displays about how the bridge was built and the transportation history of this part of the coast, but we decided to stay outside and walk back across the bridge. We could see Harbor Seals sunning on the sand bar below. On the cliff on the north side of the bay, there was a peregrine falcon. I wanted a closer look. Melissa, a teacher at Waldport High School, has been working with the students to get the Port of Alsea Kayak Shack operating again. Started by another teacher to help students learn about business, the Kayak Shack floundered when that teacher moved on. A dedicated staff person was needed — and Melissa, who had received certification in canoeing and kayaking in Arizona, showed up just in time to step into that role. Students now earn minimum wage in addition to learning valuable skills. In order to guide tours, they must be in their second year with the Shack and take the American Canoeing Association training for certification in safety. Melissa provides the education in wildlife identification and guiding skills. We needed to wait for the tide to turn, so we agreed to separate for a couple of hours. I went back to Brian McEneny’s Wood Carving Gallery in Seal Rock to look at a miniature carving of two dolphins coming up out of the water, a perfect gift for a dear friend who wishes she could jump in and swim with them. I also stopped at Indulge Sweets and bought one of their “evil brownies” as a thank you for Melissa’s above-and-beyond guiding services. We reconvened at the Port of Alsea. Although the Kayak Shack wasn’t officially open, Melissa was able to get two single kayaks for us and we headed into the bay. Halfway to the bridge, we were joined by three harbor seals. While we backpaddled and bobbed gently on the waves, one popped up off the bow of my kayak for a closer look at us. Then it gracefully dove under Melissa’s kayak and came up on the other side, its whiskers dripping. Melissa calls this “spy hopping.” Later in the spring, kayakers will see seal pups riding in style on their mothers’ backs. We paddled closer to the north shore, hoping for a glimpse of the falcons or their chicks, but they must have been out looking for food or hunkering down in the nest and we were unable to see them. By this time, the current was flowing strongly into the bay and we paddled easily up into Lint Slough, past the salt marshes where we saw three Great Blue Herons, and into the narrower part of the slough. Now we were in an ecosystem of riparian grasslands inhabited by different species. We saw river otter here, and a Redtail hawk which Melissa spotted on a tree branch. The Kayak Shack is open between Memorial Day and Labor Day, 10:00 – 6:00 Friday through Sunday, and by reservation Monday through Thursday. The guided tours are available from June 11 through Labor Day as long as there is a high tide during the day. Tours depart 30 minutes before the high tide. For rental rates and guided tour rates, visit www.whskayakshack.com. 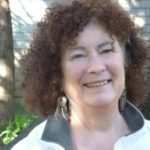 Andrea Scharf is a freelance writer based in Yachats. She is the Marketing Director for GoYachats and co-chair of the Rural Tourism Studio for South Lincoln County. She spends a lot of time wandering around the trails and roads of the Siuslaw National Forest with friends and dogs, and lives in a secluded spot along the Yachats River.